The core idea of meal prep is to plan for a set number of days (typically a week) by buying ingredients, cooking your meals or prepping your ingredients, and storing them appropriately in your kitchen for easy access. In doing so, you can save time throughout the week, limit yourself to a set amount of food/calories and stay within your food budget. You can avoid going out to dinner at expensive restaurants when you’re feeling too lazy to cook. Even $8 trips to Chipotle or fast-food drive-thrus add up; you could use the $8 you spend on one meal to buy protein, like chicken breasts, for half a week of meals. You won’t have to buy a ton of varied ingredients for different meals each night. Forget lasagna on Monday, tacos on Tuesday and steak on Wednesday. By meal prepping, you can focus on one or two meal types per week using different spices and side combos to keep your taste buds engaged all week long. You also won’t risk your ingredients or your leftovers going bad. You’ll find yourself running your dishwasher less frequently. Rather than dirtying pots, pans, cutting boards and utensils up to three times a day, you’ll just have major dish duty once a week. The rest of the week, you’ll only have to worry about rinsing your meal prep containers and small eating utensils. Not only will this reduce your water bill, but it’ll also make an impact — small, but still important — on the environment. Many people choose to meal prep so they can monitor their food intake. Whether you count calories or just want to keep a food journal, meal prepping makes analyzing your diet easy and helps you maintain a healthy meal plan. Sticking to a meal-planning calendar also means you can avoid the temptation to go out to eat during work or have impromptu ice cream for dessert. If you’re new to meal prepping, there are a few things you can do to guarantee success. The most important thing you can do when starting any new regimen — whether it is exercising regularly, reading more or changing your diet — is to start small to avoid burnout. Consider focusing on just one meal each day, like prepping your lunch for work all week. Alternatively, try to tackle three days’ worth of prep rather than an entire week’s worth. You can work up to your ultimate meal prep goals over time. If this foray into meal prep marks a new you in the kitchen, you may need to stock up on more than just groceries. Invest in quality kitchen supplies now, knowing that you’ll earn back that money in saved expenses over time. For example, if you will be cutting a lot of veggies, buy quality knives. Not sure where to start? GoodHouseKeeping.com has a few knife recommendations to consider. More importantly, invest in good meal prep storage containers. Typically, glass containers are better than plastic in terms of longevity, especially if you’ll be microwaving. Buy BPA-free products, and consider things like food separation, size and airtightness, as well as whether they can go in the freezer, dishwasher and microwave. TheSweetHome.com tested several types and brands of meal prep containers to determine the best choice for serious meal preppers. Use our meal prep grocery store hacks to save big when buying food for meal prep. Always make a list. Before you set foot in a grocery store, research what meals you will be prepping that week. Ask friends for meal prep ideas, or research online for popular meal prep recipes. Take stock of what you already have at home, and add anything you need to your list — and abide by it. Don’t go hungry. Shopping with a full belly goes hand in hand with making a list. If you’re armed with a list of what you need and a satisfied belly, you won’t be tempted to grab that bag of frozen Tater Tots. Leave the plastic at home — and use a calculator. Strand yourself at the store with just the amount of cash you are willing to spend. Make sure to use the calculator on your phone to calculate sales tax as you go. This will ensure you always stay within your meal prep budget. Buy generic and in bulk. There is no shame in buying the generic brand for most foods. In fact, take pride in knowing you are a savvy shopper when you buy generic. Likewise, if you have enough storage at home, buy food items that don’t expire quickly in bulk. This goes for paper products, cleaning supplies and frequently used spices. Refrigerate for no more than a few days. 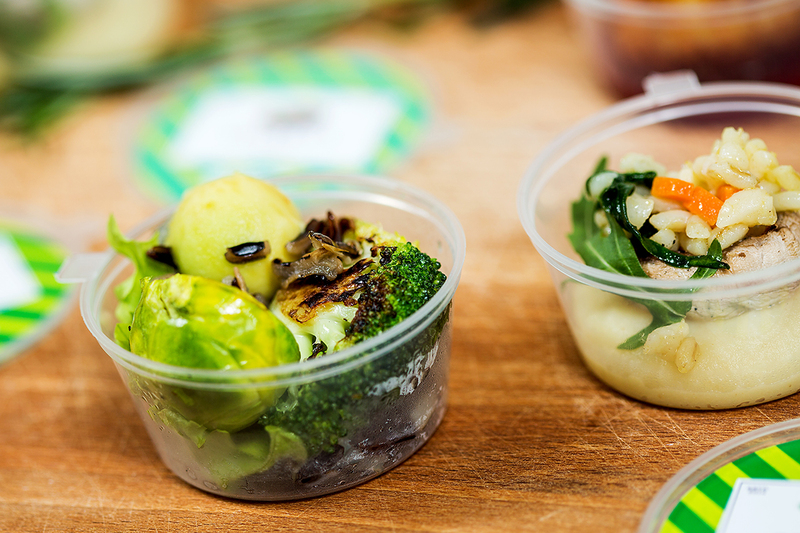 When refrigerating, use airtight containers and consider adding fresh veggies to your refrigerated meals when you heat them up. Freeze food you want to store for more than four days. Just remember to pull a meal out of the freezer and place it in the fridge the night before you intend to eat it — that way, it will have thawed out by grub time. However, remember that not all foods can be stored in the freezer. Foods to avoid freezing include eggs, dairy products and cooked pasta. Make space in your cabinets for foods that do not need to be kept cold. Consider having a dedicated and organized pantry solely for meal prep, where you can store items like protein bars, homemade trail mixes and bags of munchies. The most important thing to remember when meal prepping is to plan ahead. Research meal prep recipes that make sense for your diet and means, buy the necessary ingredients, and set aside the time to make those meals. Many expert meal preppers set aside a few hours one day each week. MealPrepHaven.com notes that Sunday and Wednesday are the most popular days for meal prep. Sunday meal prep could potentially get you through the whole week, but if you like to prep for just a few days at a time, you can prep the first half of the week on Sunday and use Wednesday meal prep to take you into the weekend. It’s also possible to do a little meal prep each morning or evening. Keep in mind, meal prepping doesn’t mean you have to cook everything all at once. Set aside time to wash and cut up all the fruits and veggies you’ll be using that week and bake your proteins; then, on the day you’ll be eating that meal, you can put the ingredients together or cook up the veggies as desired. Likewise, you can simply set aside food items in known locations (like that dedicated pantry) to make them easier to access when it comes time to cook — for example, setting aside two slices of bread in separate containers for each day of the week will give you easy access to make toast in the mornings. When determining what you’ll eat for each meal, EatThis.com recommends abiding by the 1+1+1 rule: one protein, one starchy carb and one fresh produce item. Need some digital support? Explore a number of helpful meal prep apps for your phone, including MealPlan Meal and Grocery Planner, a useful tool for getting organized. Meal prepping may seem overwhelming at first, but once you’ve found a successful routine, you’ll find that it saves you time and money — and helps you reach a healthier version of yourself — in no time.